A new CEO takes over at a struggling startup business and decides to get rid of all the employees that are slacking. On a tour of the office, the CEO notices a guy leaning on a wall. âIâm just waiting to get paid,â responds the man. An interim school superintendent, speaking at a city-wide PTA luncheon, assured members that he was always happy to hear from them about problems. He told them, "You can call me day or night, at this number . . ."
Suddenly there was a cry from the assistant superintendent. "Hey," he exclaimed, "that's MY number!" 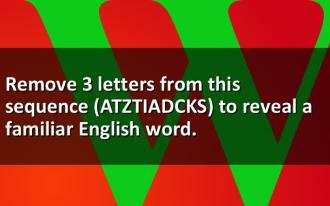 Remove 3 letters from this sequence (ATZTIADCKS) to reveal a familiar English word. Two fishermen, Paul and Jim, decided to rent a boat on a lake for their favorite sport. After fishing for 4 hours at various places around the lake with no luck at all they decided to try one more spot before calling it quits. Suddenly things started to happen and they caught their limit inside of twenty minutes. Jim says good idea, and he took out a can of spray paint and made a large X on the floor of the boat to mark the spot. With that Paul says, why did you do that, now anyone who rents this boat will know where to fish. Suddenly, her husband burst into the ki tchen. You're cooking too many at once. TOO MANY! Turn them! TURN THEM NOW! We need more butter. Oh my GOD! WHERE are we going to get MORE BUTTER? They're going to STICK! Careful . CAREFUL! I said be CAREFUL! You NEVER listen to me when you're cooking! Never! Turn them! Hurry up! Are you CRAZY? Have you LOST your mind? Don't forget to salt them. You know you always forget to salt them. A mother mouse and a baby mouse are walking along when, all of a sudden, a cat attacks them. The mother mouse goes, "BARK!!" and the cat runs away. "See?" says the mother mouse to her baby, "how important it is for you to learn a foreign language?"